A bespoke production with Fire Breathers and Fire Eaters? Based in Bristol UK but servicing clients worldwide, Spark Fire Dance provide stunning live special effects performances for corporate events or bespoke productions. Not just UK counties or cities, our professional performers are available to book for any company or private event globally. With 20 years experience as Fire coaches, feature artists, and effects designers for companies such as Cirque du Soleil and France Dragone, we’re specialists in indoor high impact spectacles. 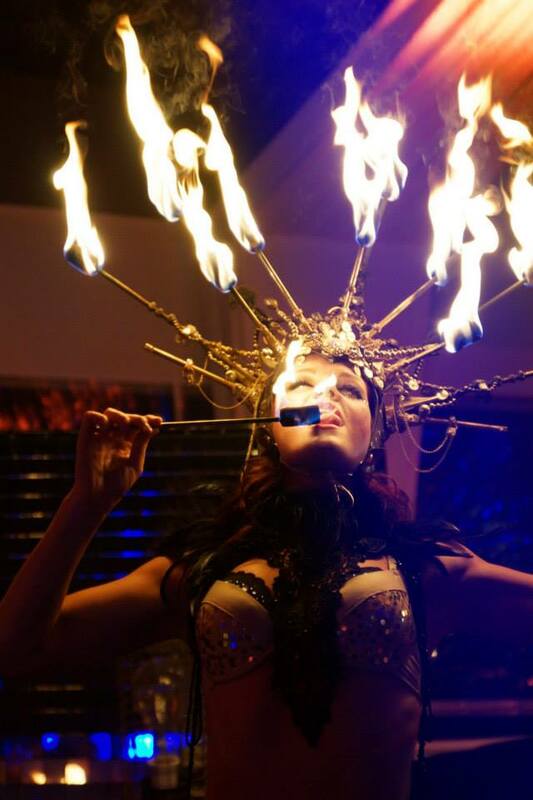 Fire eating, done well, can be an amazing act intro or act on it’s on for an intimate space. We can provide no just fire eaters, but dancers with poi, staff, LED glow, fire hula hoop and many other fire spinning props. However we don’t stop there. Many clients request a performance with fire breathers. We’ve improved on the art of fire breathing. We don’t hold fuels in our mouths, or create the mess you normally see from this. Utilising cutting edge props and techniques of our own design our entertainers can provide the fireballs and excitement the client is after, without the mess and safety hazard. Firebreathing, a dangerous and frankly passe skill is fraught with peril for both artists and audience itself. It has been superceded by new techniques with more control and the elimination of hazourdous floor residue. Contact us or view our imagery to see some of the great ways our shows satisfy this dangerous and cliche request, while improving upon it and deliver wow factor never seen before. Dan Miethke was fire coach and lead fire artist with the world famous Cirque du Soleil for 2 years, and created many of his original stage pieces during this period. 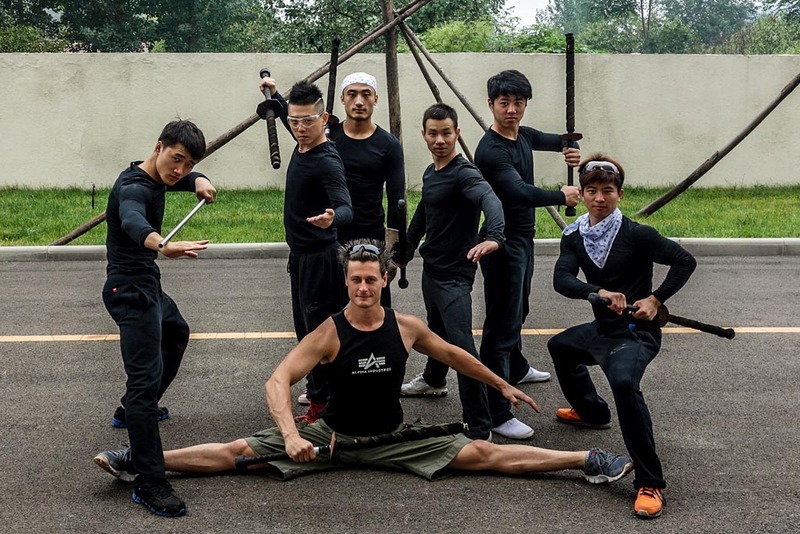 After meeting Stephanie Höggerl during an event in Shanghai, the duo formed Spark Fire Dance. Steffi has been perfecting her own acrobatic, aerial and pyrotechnics since the age of 16, and together the couple have taken Spark Fire Dance to luxury corporate and private events all over the world. Beginning from a passion to impress and manipulate this live element in new directions. Dan Miethke learnt from the world recognised talents in the Melbourne Australia circus scene. With a desire and drive to bring the raw tribal forms of 90’s fire play to a refined and accessible form for audiences everywhere. Always designing, creating and testing new forms of manipulation. Studying the details of fire fuel technicalities, and eventually advising world performance companies as a recognized expert in the field. International performances from the Burj Kalifah ballroom in Dubai, to the Force Blue superyacht Monaco. Accomplished specialists in all fire and pyrotechnic props with 20 years experience. 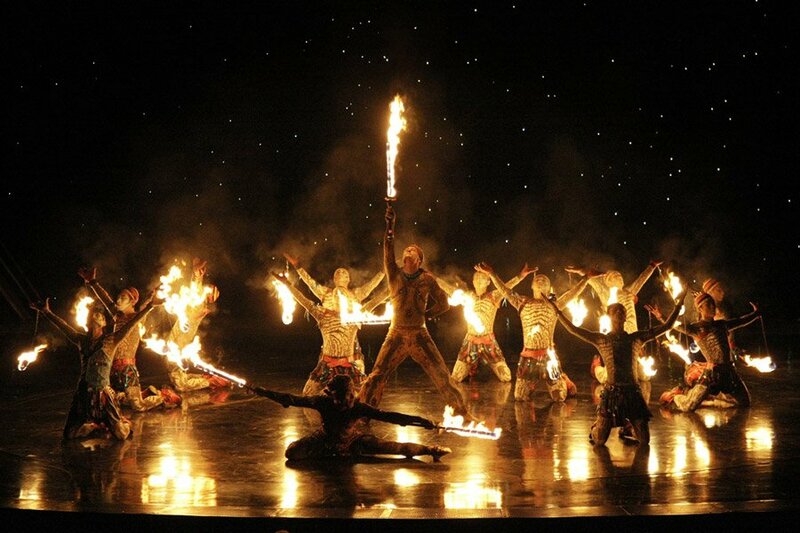 Unique ‘Dragon Fire’ special effects developed for Cirque du Soleil on the stage of ‘Zaia’. Pushing the art of corporate fire performance with signature style and over 20 years of experience their talents have been utilised for many bespoke productions. Spark Fire has previously been commissioned as consultants on the inclusion of live flame effects performance on large productions such as ‘The Han Show’ by Franco Dragone Entertainment Group in Wuhan China. Coaching the performers in the props and safe handling of the flames, and the technicians in the preparation and safety procedures. This project included designing props, technical diagrams and construction manuals for ongoing equipment replacement, plus composing extensive documentation to facilitate the productions ongoing procedures. Specialist fuels and effects are used throughout Spark Fire performances. Smoke and odor free designed for indoor use and performed in Heritage listed properties. Many venues with extremely strict OH&S regulations have hosted Spark Fire acts, such as Kensington Palace, the Burj Al Arab, Madinat Jumeirah, Venetian, Wynn, Crown, Sands and MGM casino’s. All effects can be tailored to a range of environments, flames larger or smaller depending on the available space. A comprehensive tech and safety procedure pack for clients, venue management with detailed Risk Assessments, safety methodologies and technical specifications is available on request. Normally the fire artists just light up the end of a prop and then complete figures by spinning and throwing the prop. Dan and Steffi literally dance with the fire. Dan has created their speciality props which allow them to include special effects into their act, as here where Dan literally sets his partner on fire. Minecon 2015 Mincecraft conference – Creation and Co-driection of the finale to an amazing show by Cirque Bijou. A high calibre, very private affair for a media shy high net worth clients celebration in the Maldives. Although kept to confidentiality prior to the event Spark Fire Dance are now free to describe the extravagant production we participated in for Sir Phillip Greens 55th on Soneva Fushi island. Separate stages spread across the island for performances by Jennifer Lopez, George Michael, Ricky Martin & Kate Moss. 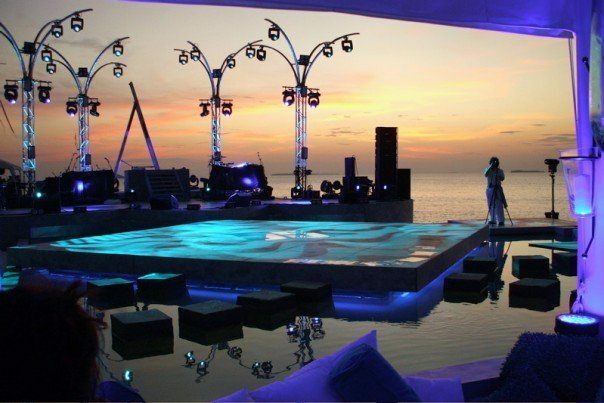 The performance was on a stage set in an infinity pool with the setting sun behind. A glamorously exclusive and extravagant event of the highest calibre. Coaching artists in the use of specialist fire and flame effects props. Training technicians in basic and advanced Fire Safety and specialised flame effects maintenance. Training technicians in the practical duties of running live fire trainings. Consultation on fuels, effects, storage, maintenance of fire props, the correct techniques for refuelling operations, risk assessments. Cirque’s special event entertainment division provide event performers, corporate entertainment acts & Cirque du Soleil artists of unrivalled quality to events worldwide. After years of close work with Cirque’s teams we know the performers & circus artists that can bring a Cirque du Soleil theme to life for your event. Circus acts from across Europe & UK performers available for worldwide events. 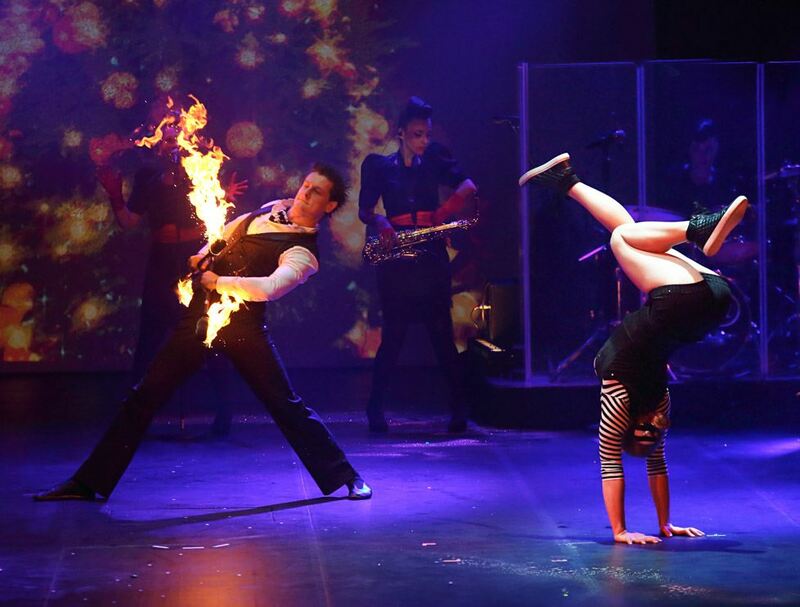 Not just fire eaters, fire jugglers & fire breathers but acrobatic, equilibristic and aerial acts of Cirque calibre can be added into a custom creation for simply spectacular results. From concept to creation we can bring together a network of professionals to design a stunning centrepiece for your event. Alessandra: There were sparks everywhere, even in my eyes, because it was so beautiful… and also what this very, very beautiful and talented Miss did with her sort of fans. I found this very, very beautiful, choreographically very accomplished. They are courageous, they are good looking, they are young, Truly they have a lot to offer. I have truly never seen anything like it. Arturo: I liked the mix of Jazz with Fire, it gave visions of some kind of gambling den or casino, with the devil playing cards. The production is extraordinary. Lara: I think if you play with an element so vivd and so dangerous as fire with such mastery, you can’t be anything but ‘The Best’. In The United Sates I see a lot of fire acts. Thus I loved the innovations here. He was able to research how to create much bigger flames. I like it when a fire performer is able to play with the risk and with the audience and to bring the flames so close to the audience as you did. I think now at this level of prop manipulation, of knowing the fire, I really hope that they will continue pushing the limits and to create more works together. Sébastien Stella: Spark Fire Dance – I found them outstanding, very dangerous and very impressive and very elegant at the same time. They act, they literally play with fire, acrobatics, dance, all of it. Available for your luxury wedding, these sensational fire shows can also add a spark to your product launch, cocktail party or awards reception, but dates book fast. 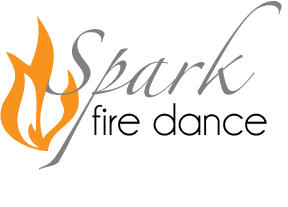 Please contact Spark Fire Dance via the contract form to avoid disappointment.